Casa Pacifica is ideal for four couples or adult families. Four of the five bedrooms have king beds, and the remaining suite has two full beds. The whole villa is super warm and elegant, with lots of natural accents and chic accents. I love the Los Suenos Resort, because it has tons of activities, restaurants, and shops within a safe, gated community. 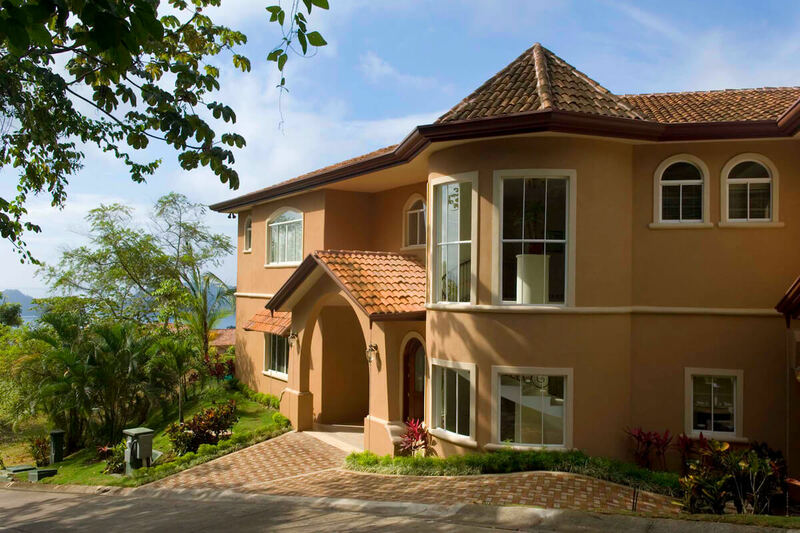 Casa Pacifica is a 5,000 square foot private retreat in the Vista Tres Bahias gated community. This villa enjoys panoramic views of the Rainforest Reserve and the ocean. The turquoise swimming pool stretches the length of the gardens, and has a hot tub for 10 people. There’s space to lounge, grill, and dine under the veranda, as well as a covered lounging balcony on the upper level. Casa Pacifica offers central air-conditioning and WiFi throughout its interior. Natural stone accents, wood furnishings, and neutral decor adds a warm and elegant atmosphere. The living room features a flatscreen TV and sliding door access to the veranda. The gourmet kitchen is fully equipped with Subzero and Wolf appliances, a wine cooler, and a dining table for 10. Upstairs, there’s a game room with vaulted bamboo ceilings, a wet bar, a 50” plasma TV, a custom pool table, and board games. All five bedrooms have a 50” plasma TV and an ensuite bathroom. Downstairs, there’s a master bedroom with a stone tub and a dual shower head. Upstairs, there are three king suites and a children’s suite with two full beds. Casa Pacifica is located in the hills above Los Suenos Resort, and is a short drive from several activities and restaurants. There are golf courses, a marina, cafes, and supermarkets within the Los Suenos resort.